My '05 berg doesn't have an ignition module (in terms of a key to turn). I could buy one for about $25-30, but there are relatively heavy and unsightly. Instead of a key, I plan to install an on-off switch somewhere on the bike to prevent somebody from climbing on and hitting START. The switch will basically cut power the the starter motor. I intend to put the switch somewhere somewhat hidden so that when I climb off the bike, say to go into a store, I can flip the secret switch and disable the ignition (starter motor). When somebody walks up to the bike, say a thief, they will not intuitively know that there is a second hidden button on the bike. Where's the best place to put this switch? Since my bike also doesn't have a key i was going to fit a rfi tag to act as the key. i was going to put the microchip fob sewn into my jacket sleeve or glove so i could just swipe it near the reader which would be hidden i haven't got around to doing this yet but that's my plan at some point. you could hide a switch under the frame behind a fearing and fit a dummy switch on the handlebars to slow them down. Here's a thought. Your kill button grounds the ignition to stop the engine. If you wire the kill button circut through your hidden switch, voila, the bike won't run when the switch is engaged. The starter will still turn over when the start button is pushed but it won't start. You can still flip out the kick starter and use that but, again, it won't start. I have this setup on one of my bikes and it works great...except when I've forgotten to switch it to the "run" position and start kicking expecting it to light right away. In my case, the bike is kick only. Since my bike also doesn't have a key i was going to fit a rfi tag to act as the key. This is a cool idea, but I was hoping for a $5 solution. Here's a thought. Your kill button grounds the ignition to stop the engine. This is the ticket! 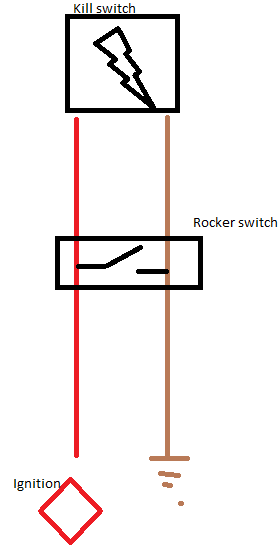 So, the thing is that the kill switch is intermittent, so putting a rocker switch (on-off) in line won't do anything... Unless I connect the "in" and "out" wires to the kill switch in the rocker. I won't pretend to be any good with electronics, but have a look here. Perfect, killing the starter wasn't the solution. You can find some pretty inexpensive lock set up out there. 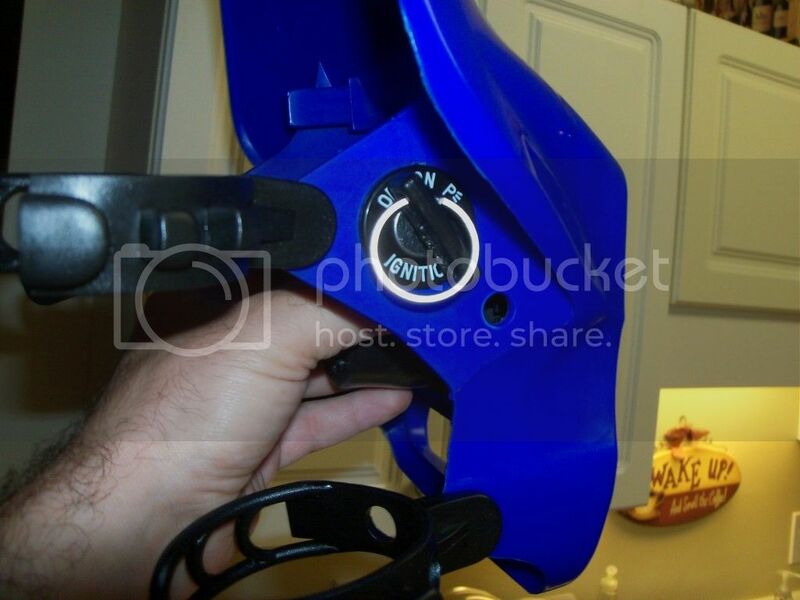 Baja Designs has a nice one that mounts to the handlebar clamps. Here's one mounted to the headlight shroud. Following the key'd examples, what does a key switch do? Do it perform the same function as a rocker switch (ground the ignition "coil")? it's the only bike I don't lose the key for! Besides, it disciplines me to carry a lock. Let's face it, a cheap key ignition is defeated by a screwdriver in 3, 2, 1 gone! Sure, they can lift the berg into a truck, but a key isn't stopping that either. so, I'd rather not have one and stick to a chain lock at night and a disc lock when out on a ride. Another problem is somebody just hitting the start button and having the bike turn over. My kill switch is crappy and doesn't do a great job (don't think it stays "clicked down", so the engine will shut off, but the start switch is never permanently disabled).